Ashley Freeburn is an active violinist residing in Pittsburgh, Pennsylvania. Ashley earned her Bachelor’s of Music degree at the Cleveland Institute of Music with David Updegraff and her Master’s of Music degree at Carnegie Mellon University with Cyrus Forough. In addition to being a founding member of the Bell’Art Ensemble and the Living Room Chamber Music Project, Ashley is a founding member of several performing ensembles in the greater Pittsburgh area, including newly formed women’s chamber orchestra, the Kassia Ensemble, and the former Freya String Quartet. As a member of FSQ, Ashley collaborated with a wide variety of artists spanning the genres from pop to classical. The quartet held residencies at the Charlotte New Music Festival and Opera Theater Summerfest. 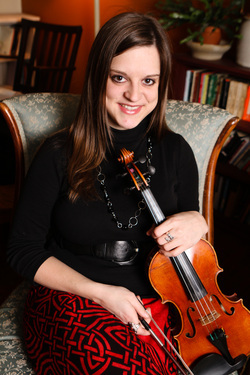 As a chamber musician, Ashley has been featured in concerts throughout the United States, including performances at the Kennedy Center for the Performing Arts, Severance Hall in Cleveland, in the Grand County Series of Colorado, in the Treefalls Series of South Carolina, as well as throughout West Virginia, Ohio, and Pennsylvania. In addition, she has given numerous educational and outreach presentations in the greater Pittsburgh area in a wide variety of venues. An active proponent of new music, Ashley has premiered and performed several works by living composers, both in solo recital and as a chamber musician. Ashley is currently the Associate Concertmaster of the Butler County Symphony Orchestra. She is a core orchestral member of Resonance Works and the Pittsburgh Festival Opera. She has performed with the Erie Philharmonic, and the Canton, Youngstown, West Virginia, Wheeling, and Westmoreland Symphony Orchestras, among others. Ashley has also shared the stage with such international artists as Barry Manilow, Belle and Sebastian, Josh Groban, Clay Aiken, and the Trans-Siberian Orchestra. Ashley is frequently heard performing live on Pittsburgh’s local classical music station, 89.3 WQED. Ashley is also frequently heard on Pittsburgh’s independent radio station, 91.3 WYEP, in recording with several of Pittsburgh’s finest singer-songwriters, including Joy Ike, Ben Hardt, Tim Ruff, Paul Luc, and Juliana Carr. Ashley believes in music as a means for cross-cultural dialogue. She has traveled to Ireland, Ghana, and Turkey, to teach, work and make music with local musicians. She is very interested in folk music, native influences, and local sounds. She has served as violin faculty at the Center for Young Musicians. She is currently Adjunct Instructor of Violin at Chatham University. Raquel Winnica Young earned a Degree in Vocal Performance from the Colon Opera House in Buenos Aires and an Artist Diploma in Voice from Duquesne University. Ms. Winnica Young's career has taken her to concert halls throughout the Americas and Europe. Equally comfortable performing early music, new music and chamber music, she performed in Handel’s La Resurrezione at the Bach Festival in Lausanne, Switzerland, the world-premiere opera Marianita Limenia by Valdo Sciamarella in Buenos Aires, the European tour of the opera Medeamaterial by Pascal Dusapin with Remix Ensemble and presented recitals for Festival Martha Argerich at the Colon Opera House and Festival Llao Llao. Recent performances include the world premiere of the Baroque pastiche opera “Winter’s Tale” with Chatham Baroque and Quantum Theatre, the world premiere of the opera “Constellations” by Efrain Amaya in Philadelphia, "Frida" by Xavier Rodriguez and "Speed Dating Tonight" by Michael Ching with Microscopic Opera Company, "Messiah" with Chatham Baroque, recitals with The Newberry Consort in Chicago IL and Durango, Mexico as part of the Festival Musica del Virreynato. Past performances include C.P.E. Bach’s Die Israeliten in der Wüste and the title role of Orfeo ed Euridice in Argentina. Closer to home, she sang in Vivaldi’s Gloria at the Strings Music Festival (Colorado), Die Zauberflöte (Third Lady) with Apollo’s Fire in Cleveland, Artemisia (Alindo) with Helios Early Opera in Boston, and Durufle's Requiem with Altoona Symphony. With Quantum Theatre she performed the principal role in Astor Piazzolla’s Maria de Buenos Aires and Osvaldo Golijov’s Ainadamar, where her portrayal of Federico García Lorca earned her a spot on the Pittsburgh Post-Gazette’s “Best of 2012” lists. Ms. Winnica Young has performed as soloist with the Pittsburgh Camerata, Chatham Baroque, Pittsburgh Baroque Ensemble and the Johnstown (PA) Symphony. She is also a founding member of the Bell'Art Ensemble and the Living Room Chamber Music Project concert series. Master Classes in Baroque Music, Chamber Music and Oratorio in Pittsburgh, Indiana, and Argentina. A native of New York, Jack Kurutz is an avid recitalist and chamber musician with a penchant for contemporary music. In Boston, during his Master’s Degree program at the New England Conservatory of Music, he performed with ensembles including the Boston Modern Orchestra Project, the Harvard Group for New Music, the Callithumpian Consort, and Enchanted Circle. He performed works by Conlon Nancarrow, Francis Poulenc, John Adams, Charles Ives, and Lee Hyla. 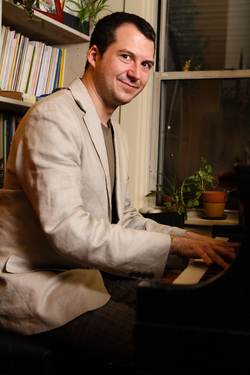 In Pittsburgh, Mr. Kurutz has been appeared extensively with the Contemporary Music Ensemble of Carnegie Mellon University, where he presented Bartok’s Sonata for Two Pianos and Percussion as well as the Pittsburgh premieres of John Adams’ Hallelujah Junction and Grand Pianola Music for two pianos. He has also appeared as guest artist with the IonSound Project, including a performance of Messiaen's Quartet for the End of Time. Throughout his studies Mr. Kurutz has been recognized for his command of diverse piano repertoire. He has appeared as recitalist and chamber musician in the cities of Montecastello di Vibio (Italy), Salzburg (Austria), New York, Boston, Chicago, Atlanta, Miami, and Charleston (South Carolina). He has also performed in numerous master classes, including those of John Perry, Earl Wild, Ilana Vered, Sergey Schepkin, Alexander Korsantia, and Randall Hodgkinson. Performances in festivals include the Music Festival of Monte Castello di Vibio (2006), Piccolo Spoleto (2004), and the Aspen Music Festival (2002). Mr. Kurutz received his undergraduate degree from the University of Miami, studying with Ivan Davis, and earned his Master of Music from New England Conservatory in Gabriel Chodos’ studio. In 2005, he completed an Artist Diploma from Carnegie Mellon University. In September 2007, Mr. Kurutz won First Prize in the William Garrison Piano Competition sponsored by the Baltimore-Washington Chapter of the American Liszt Society. Additionally, he was awarded a prize for the best interpretation of a Franz Liszt composition. In 2009 he was a finalist in the Simone Belsky and Steinway Society of Massachusetts piano competitions. In May of 2011 Mr. Kurutz was the featured soloist with the Pittsburgh Philharmonic in a performance of Rachmaninoff's Second Piano Concerto, under the baton of Maestro Walter Morales. He is currently on the faculty at the Pittsburgh Music Academy and holds a teaching position at the Carnegie Mellon University Preparatory School. Please visit www.jackkurutz.com for more information. Lenny Young, in addition to being a sought-after collaborative artist and teacher, is Principal Oboe of the Altoona Symphony Orchestra. He has also performed with the Pittsburgh, Wheeling and McKeesport Symphonies. He has worked with local composers and arrangers in productions for Pittsburgh Irish and Classical Theater, Point Park Conservatory, and Pennsylvania Dance Theater. As a soloist, he composed and performed original music for Point Park Repertory Company's productions of Knights of the Round Table, The Third Lie, and Death Of A Salesman. He worked extensively with Pittsburgh improvisation ensemble Dust & Feathers as well as with choreographers and visual artists. Lenny has worked in a variety of chamber-music settings, from woodwind quintets and octets to larger mixed groups like the Duquesne New Music Ensemble and the American Wind Symphony Orchestra. He also led several improvisational groups—the jazz quartets Ensemble Duchamp and Comprov Group as well as the oboe/piano duo Levendis. Currently he is a composer-member of the new music ensemble Alia Musica Pittsburgh and one half of Duo Paginas with his wife Raquel, for whom he has composed numerous works. He holds BFA and MM degrees in music performance from Carnegie Mellon University, where he studied oboe with Cynthia Koledo DeAlmeida, improvisation with Eric Kloss, and composition with Reza Vali. He maintains a teaching studio at Johnstonbaugh’s Music and this fall began teaching music theory at Pittsburgh CAPA. Lenny also sings with The Pittsburgh Camerata and conducts the choir at Third Presbyterian Church in Shadyside; he composes and arranges for both ensembles. Ms. Miller served as a studio coach and accompanist at Carnegie Mellon University's School of Music. She has performed with members of the Pittsburgh Symphony Orchestra, winners of the Pittsburgh Concert Society, and CMU faculty. She worked extensively with the violin studio of Cyrus Forough at Carnegie Mellon University. She has also served as a piano teacher at the Pittsburgh Creative and Performing Arts High School (CAPA) and the CMU Preparatory School, where she taught group piano class as well as private lessons. All photos by Alisa Garin Photography.